Once thought of as just a passing fad, social media has had a tremendous impact on business over the past decade. Social platforms like Twitter and Facebook have transformed the way that people communicate and, in the process, have changed the way that businesses interact with customers. In fact, social media’s influence runs deeper than customer engagement. Departments like sales, human resources, product development and market research are launching successful campaigns. But while the Internet is littered with success stories, there are still many social media challenges we’re figuring out. There’s no surprise that this is high on our list of challenges. Creating a social media strategy can be daunting. The first thing you need to know is exactly what it is. A social media strategy is a summary of everything you plan to do and hope to achieve for your business through the use of social networks. Start by creating a list of social media objectives and goals. The more specific you are, the more effective you’ll be at implementing them. These objectives should align with your broader marketing strategy and business goals. Keep it as concise as possible and make sure they’re attainable. The purpose of a social media strategy is to guide your actions, but it’ll also be a measure by which you determine whether you’re succeeding or failing. The metrics you choose to monitor will be influenced by the goals you set; however, we recommend that you look beyond vanity metrics like your number of followers. To really get an idea if your efforts are paying off, focus on things like leads, link clicks and impressions. If you already have an established presence on social media, we recommend kicking things off with a social media audit. This will help you assess your current social media use, what’s working, what’s failing and what can be improved upon. Once your social media strategy is in place, repeat your audit quarterly so you can keep tabs on your performance. Social media ROI is what your business gets back from the time, money and resources you’re putting toward social media marketing. The tricky thing about it is that social media ROI is different from traditional online marketing. It can be hard to see the value of your Tweet or post getting shared compared to clicks on an ad. With strategic goals in place and the right tools, understanding what you’re getting back from social media isn’t too difficult. But there’s more to it than we can cover in this round-up, which is why we recommend reading through our Ultimate Guide to Measuring Social Media ROI. When building an online presence, you’re really focused on generating awareness and driving organic reach. In order to be successful here, sometimes you have to pull out the big guns. An extremely valuable and largely untapped asset are your employees. What better group to represent your brand than the people who define it? One of the easiest ways to turn your employees into brand advocates is to make it easy. We recently launched Bambu, an employee advocacy platform that makes it easy for companies to curate content for employees or brand ambassadors to share with their social networks. It’s a great way to streamline the important messages and content that matter to your brand. In a 2013 study, 41% of respondents said employees are the most credible source of information regarding a business. Make sure your team is sharing the right information by educating them on your company’s history, products and goals. And by using a platform like Bambu, you can feel confident that your employees are sharing the right message. Adobe is a great example of a brand that sees the value in empowering employees to become brand advocates. The company took 21 employees from seven different locations who were already doing a good job sharing socially and asked them to take part in its brand ambassador program. The group is pre-briefed on Adobe announcements and are given the chance to be first to share. Last year, two of the employees attended Adobe’s annual creativity conference and generated 5.5 million impressions in just five days. 74% of consumers use social media to make a buying decision. 90% of people use social media to communicate directly with brands. 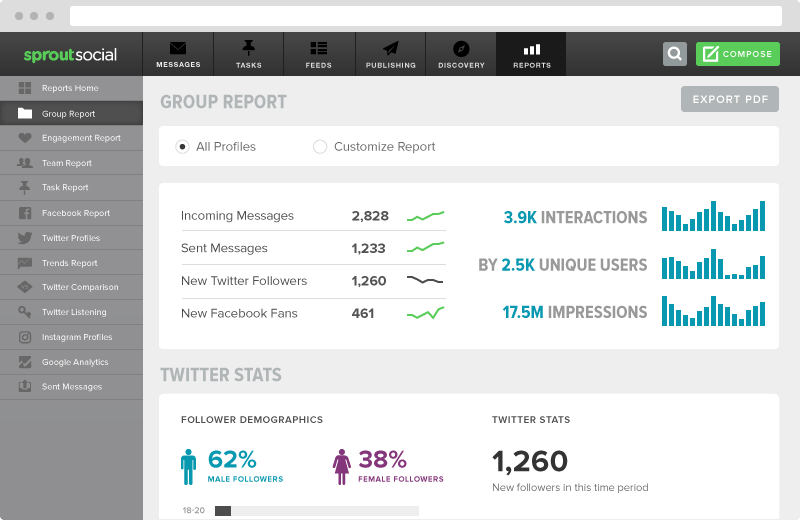 With stats like those, it’s obvious that your business should be active on social media. Deciding which platform to build a presence on, however, can be a bit of a challenge. Fortunately there’s an easy solution, and it all comes down to one thing: your audience. On which social networks does your target audience spend their time? You need to familiarize yourself with the demographics for each social network and see if your target audience is among them. It’s not enough to know where they are; you need to know where they’re active. Amassing hundreds of followers doesn’t necessarily mean that you have an audience. There are abandoned and fake accounts to consider. You need to find out where your target audience is actively contributing because if you’re not reaching the right people, then you’re not meeting your business goals. Once you’ve established yourself on a social platform, use a social media analytics tool to monitor engagement with your account and audience demographics. You’ll also want to be aware of which social networks offer targeting capabilities in case you want to reach specific subsets of your audience. You put a lot of time and effort into your content strategy, so it’s discouraging when something you publish doesn’t perform well. It’s understandable, but it’s indicative of a larger issue: over-saturation. Every day, 95 million photos and videos are uploaded to Instagram, over 500 million Tweets are sent on Twitter and more than 350 million photos are added to Facebook. People are inundated with content so it’s not as easy for yours to stand out as it once was. The key to driving reach is finding the right content mix for your audience. 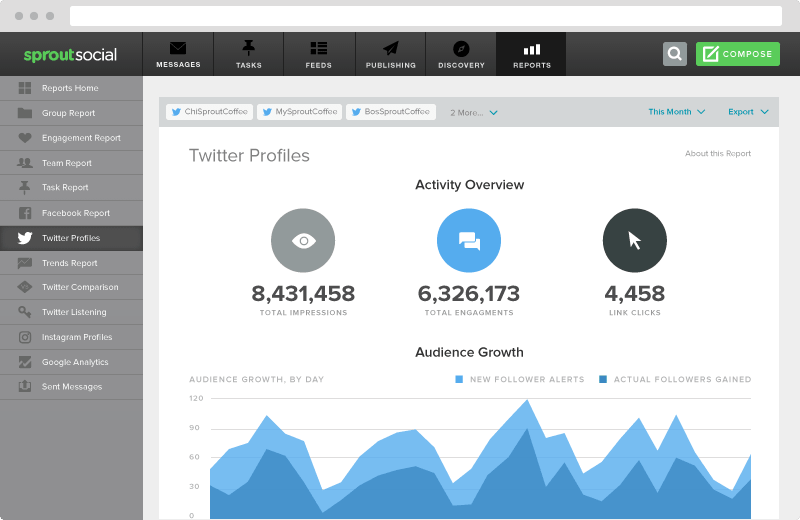 Use a social media management tool to monitor the engagement with your posts. Track which posts are performing well and which ones aren’t. Do you notice any performance trends? For instance, are posts with photos performing better than those without. Use these insights to make data-driven decisions about your content strategy moving forward. Regardless of which platforms you’re using, your goal when it comes to content is to keep it engaging, educational and entertaining. Never publish content just for the sake of making an update. Think back to your social media strategy and focus on publishing content that fulfills your business objectives. Always track your performance and be flexible enough to make adjustments where needed. The awesome thing about social media is that it’s available to businesses of all shapes and sizes across industries. But for some, incorporating social media into marketing strategies is a bit more complicated—especially those in regulated industries like alcoholic beverages, healthcare, financial institutions and government. You should work closely with your legal team to ensure that your social media practices are compliant with these rules and regulations, but don’t let them discourage you. You might have a few more hoops to jump through in order to get a Tweet published, but they’re not working against you. President Barack Obama’s “Four more years” Tweet held Twitter’s top most Retweeted spot until Ellen’s 2015 Oscar selfie. And Budweiser’s “Friends Are Waiting” Super Bowl commercial was not only featured in YouTube’s top 10 ads of 2014, but it garnered more than 10 million views in only four days. Social media is a great way to build awareness and attract new customers, but you have to think about what you’ll do to retain them. While 86% of social media users follow a brand, almost 60% of them are annoyed with too many promotions. You can’t always be selling. In order to increase brand loyalty, you need to focus on developing a rewarding, humanistic relationship with your audience. One of the ways you can achieve this is through storytelling. Your outreach efforts on social media shouldn’t always be about selling. If you want customers to stick with your brand for the long haul, you need to give them a reason to. Through storytelling you can introduce your core values, giving customers relatable reasons to stick around. Companies like Dove, Nike and Always are great examples of how inspirational and story-driven content can help humanize brands and instill brand loyalty. These brands continuously publish thoughtful, inspirational content that represents their missions while also making them more relatable to individuals. You can also increase brand loyalty and strengthen your connection with customers by being responsive. The best way to humanize your brand is to act like a human. When people reach out, whether it’s positive or negative in nature, reach back—and do so in a timely manner. The Q3 2016 Sprout Social Index shows that 1 in 4 people get annoyed when you don’t respond to them. This can be easily remedied with the help of a social media monitoring tool. People only retain about 10% of the information they hear, but when paired with a relevant image, that number jumps to 65%. You want your message to stick with people. Photos and videos have become powerful tools for marketers looking to communicate effectively with followers. Visual content has taken over almost every major social network, including Facebook, Instagram, Twitter and Pinterest. In fact, content with relevant images get 94% more views than content without them. Not only can adding an image to your social media posts increase engagement, but it can also help you tell a great story. Visual content can easily distill complex information and helps brands tell stories quickly with impact and emotion. Tapping into emotions can drive deeper engagement, so make sure that the visuals you’re using align with your broader objectives. In other words, make sure the images or videos you’re using are relevant and aren’t there for the sake of taking up space. Coming up with original visual content for every social media post you publish can be difficult. Fortunately there’s help. We’ve put together a list of free image creation tools to support your content. Social media is meant to be a two-way communication channel, but too often it’s used as a promotional mechanism. While marketers use social networks as broadcasting outlets, 90% of customers use social as a way to communicate directly with brands. 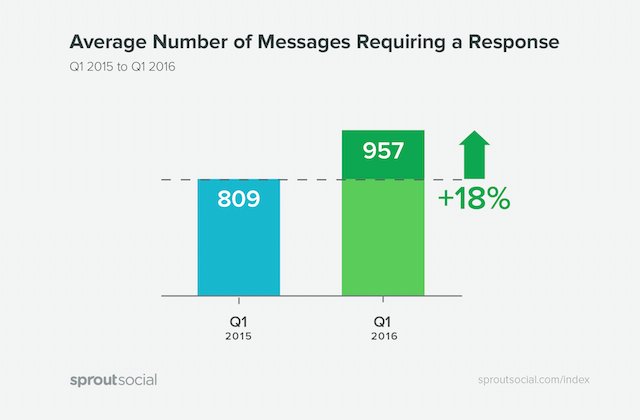 The number of social messages requiring a response have increased 18% between Q1 2015 and Q1 2016. However, brands reply to only 11% of people. This could be because brands are missing some of the messages that come in—especially if you regularly see high volumes of incoming messages. 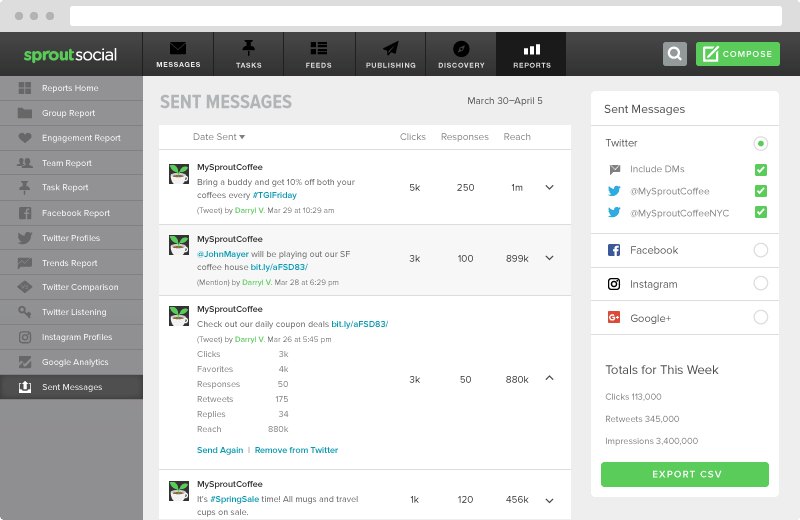 Using a social media management tool like Sprout Social, you can make sure that messages never go unnoticed. With all your social messages in one place, you can provide cross-channel support and quickly identify whether it’s an issue to resolve or a chance to delight a customer or an opportunity to join a conversation. And if you’re working with a team, you can make sure that no one is duplicating efforts. With Sprout you can assign and manage tasks, routing them to the best departments. You can also hide completed messages so you’re able to focus on the ones that need your attention. Social signals like Retweets and Facebook shares help generate brand awareness, but it’s not always as easy as asking for them. If you want to increase your reach through social shares, start by optimizing your content. For example, make sure that the content you’re publishing is interesting and something that your audience would find valuable. Keep up with trends and monitor which posts your target demographic is engaging with. Engagement is a huge part of marketing. Not only is it a major metric by which you measure your effectiveness, but it’s also used by several platforms when deciding which content to deliver to a user base. 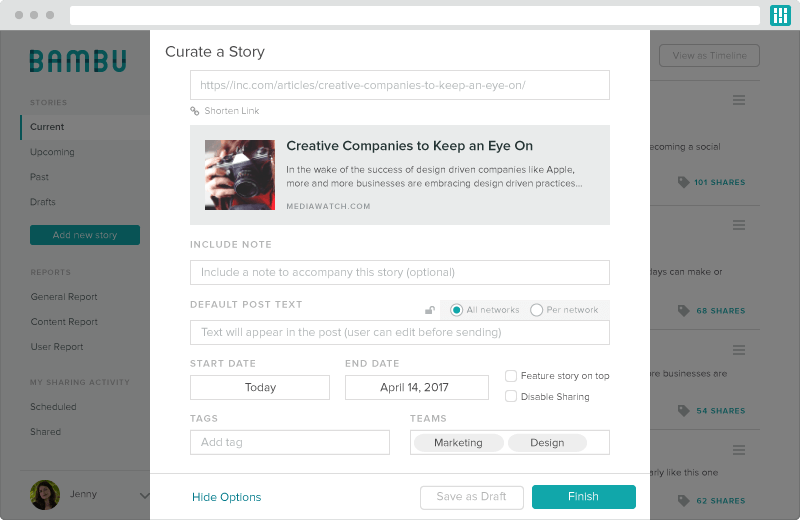 Want your Facebook post to appear in more News Feeds? Make sure it’s something people can engage with. Experiment with different types of content and explore new ways of capturing the attention of your followers. If you’re consistently posting interesting, entertaining and relevant content, you’ll have no problem driving engagement and boosting your reach. Equip your brand with the right tools and follow the tips we outlined to avoid social media challenges that hold so many businesses back.